Considered the signature dish of San Francisco, Cioppino is a wonderful seafood stew that is perfect for entertaining and holidays. Serve this with crusty sourdough bread to sop up all the delicious broth for a truly Californian dining experience! Melt the butter over medium heat in a large stock pot, then add the onion, fennel, garlic, parsley, sauteing until the onions are soft, about 10 minutes. Add the garlic, basil, salt, thyme, oregano, and red pepper flakes and saute 2 minutes longer. Add the white wine, crushed and diced tomatoes, fish stock, and bay leaves, then cover and reduce the heat to medium-low. Simmer for 30 minutes so the flavors can blend. While the meat simmers, prepare the crab by removing the crab legs from the body (if not already done for you) and using a nutcracker to crack the shells (leave the meat in the shell) so that the meat can be easily removed once the cioppino is served. Increase the heat to medium and add the clams and mussels to the broth and cook for 5 minutes until they start to open. Then add the crab legs and cook for another minute, followed by the shrimp and scallops. Finally, lay the chunks of cod on top of the broth and cover and cook for 3-5 minutes until the mussels and clams are open, the shrimp curl and the scallops are just firm. Ladle the cioppino into large bowls garnish with chopped fresh parsley and basil. Serve with warm, crusty sourdough bread! Have plenty of napkins, extra bowls for shells, and nutcrackers and tiny forks on hand for the crab. * You can replace all or part of the fish or seafood stock with the same amount of chicken stock along with a small bottle of clam juice instead. ** If dungeness crab is not available, you could use snow crab, blue claw, stone crab claws, or even Alaskan King crab. 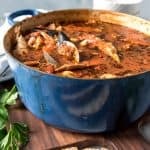 Also, you could just use crab meat instead of the legs and body, which would certainly make this cioppino easier to eat, although it is such a fun presentation to have the crab legs.